– Feature Article – Whoops! 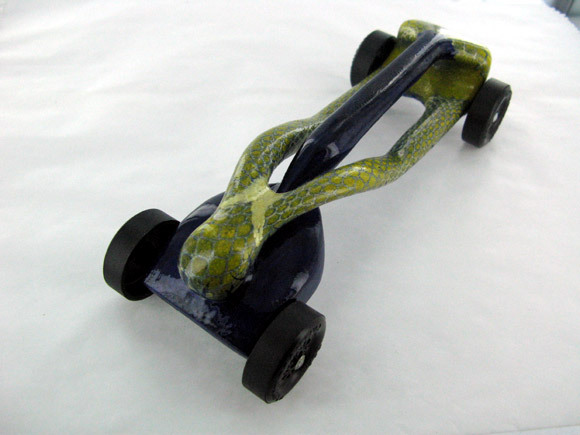 Building a pinewood derby car is a blend of art and science. Certainly, getting top speed from the vehicle is the science part, while making a good-looking car requires an artistic touch. The pine block is the art media with which you must work, and it is not always the easiest media to work with. While working with this media, many unplanned events can happen, some of which can be classified in the “Whoops!” category. For example, you may be working away on your pinewood derby car, when suddenly a big chunk of wood breaks off! What do you do? Or maybe the paint has dried, but a big drop of paint has ran down the side of the car! Can it be fixed? These – and many other – minor catastrophes happen all the time to pinewood derby car builders. Fortunately, most of these things can be fixed with no lasting damage. To help you deal with these situations, today’s feature article will share ideas on how to deal with several “Whoops!” situations. Pre-insert a spare axle into each axle slot position or each axle hole before working on the car. Then remove the axles with pliers. Don’t use excessive force to insert weight into a hole or cavity in the wood; either make the hole bigger, or the weight smaller. When creating a weight cavity with a chisel, use a sharp tool, and work slowly. Don’t try to pry off any more than a thin shaving of wood. Don’t drive a screw into the wood without first drilling an appropriate sized pilot hole. Open up the crack by inserting the tip of a small flat blade screwdriver (or another thin metal item) into the crack. Put white glue or yellow Carpenter’s glue into the crack. Use a toothpick or something similar to spread the glue in the crack. Remove the screwdriver and clamp the block. If you don’t have a clamp, wind masking tape tightly around the block. Wipe off any excess glue, and allow the glue to dry. Spread white or yellow glue over the entire broken area. Put the two pieces back together. Clamp or tape, wipe off any excess glue, then allow the glue to dry. If the block does not fit well together, then the best bet is to start again with a new block. This is a common occurrence, especially when creating weight pockets around axle slots. To minimize the problem, leave 1/4 inch or more of wood around axle slots, and work very slowly around axle slots. Axle supports/struts also tend to break off. To minimize this occurrence, insert a spare axle into the axle slot/hole while working on the strut. If something does break off, here are some ideas to fix the problem. As a bit of encouragement, a good wood glue is very strong, sometimes even stronger than the original wood. Glue the chip in place with white or yellow glue. Use masking tape to hold the chip in place. Wipe off excess glue, and then allow the glue to dry. Sand the repaired area after the glue dries. Use wood putty to patch the hole. After drying, sand the patched area. Find a piece of pine and cut/carve it to fit roughly into place. Glue the piece of wood in place with white or yellow glue. Use wood putty to fill in any gaps. This is one of my favorite mistakes. Measure twice and cut (drill) once is the old wood-workers adage, which is an all too easy step to skip. So, to ensure that holes are drilled in the right place, measure and mark the drilling location. Then before drilling, re-check the position of the hole — is the block turned backwards or upside down? Buy a proper sized dowel rod at the local hardware or craft store. Cut a piece of the dowel rod about 1/2 inch longer than the depth of the hole. Place white or yellow Carpenter’s glue into the hole. Insert the dowel rod piece. After the glue dries, trim down the dowel rod with a fine toothed saw (a hacksaw works well). Patch the spot with wood putty and sand. Glue one or two toothpicks into the hole. After the glue dries, trim off the excess toothpick material. If the saw cut was barely started before the error is discovered, then the cut can generally be removed by rounding the area with sandpaper, or by patching the cut with wood putty. Cars less than 7 inches long generally run slower than cars of the maximum length. Additional weight may need to be added to compensate for the removed wood. Dents happen very easily to pinewood derby cars. Cars get dropped, or banged into the edge of a table. Fortunately, many dents can be corrected. If an edge or face of an unpainted car is dented deeply, some wood putty can be used to fill the dent. However, if the dent is shallow, it is oftentimes better to remove the dent by swelling the wood fibers with water. Use a sewing pin to poke several shallow holes in the dented area. Apply a few drops of water to the dent, and allow the water to dry. If the wood does not swell enough to correct the dent, repeat the treatment. Speed up the drying process with a hair dryer. After the wood is dry, sand the affected area. Getting a nice paint job takes practice, a good quality paint (mixed very well), a smooth finish, a painting location with no wind or dust, and the correct ambient temperature. Even then, runs can happen if too much paint is applied. So first, check the directions on the paint and follow them, especially the application temperature range, and the re-coat time. Next, apply several thin coats of paint, instead of one or two thick coats. When spraying, always keep the can moving; don’t hold it still and just spray one spot on the car. But when the inevitable run does occur don’t panic. If you plan on applying additional coats of paint, allow the run to dry and then sand off the run. You may have to sand off quite a bit of paint, and then reapply a few coats. Note that when sanding paint, using dampened wet/dry sandpaper works better than dry sandpaper. If you have finished painting, then cover the run with a nice decal or sticker. Decals are great for hiding paint runs and other flaws in the car finish! Lubricate the wheels and axles before attaching them to the car. Not only will this keep the car cleaner, it is also easier and results in more thorough lubrication. Wash your hands after lubricating and before touching the car. Allow the paint to completely dry before mounting the wheels on the car. But inevitably some graphite will get onto the paint. So, here are a few ideas for removing graphite. I suggest testing them on the bottom of the car (or a scrap piece of wood). Paints vary considerably in chemical content, so while these tips will work on some paints, they may not work well on all paints. Erase the graphite with a pencil eraser. Rub the spot with a dab of vegetable oil on a clean rag. Spray some “Simple Green” on a clean rag and wipe. Spray “WD-40” on a clean rag and wipe. Apply a paste wax or car polish with a clean rag. This car was made mostly with a Dremel Tool. It takes a little patience to make sure you’re not cutting through so fast that you actually cut where you don’t intend. After shaping, the car was ready for a good thorough sanding and a paint job. First I applied a deep blue base coat and then a second lighter silver coat, taping off the areas I wanted to remain blue. The really unique thing about this car’s paint job is the scales. I used a woman’s fish net stocking which had to be stretched and fastened using sewing pins. After applying a yellow coat I removed the fish net stocking. I then blended the blue and the scales together with a fine tip hobby paint brush. Once that was done a couple applications of clear coat and the paint was finished. 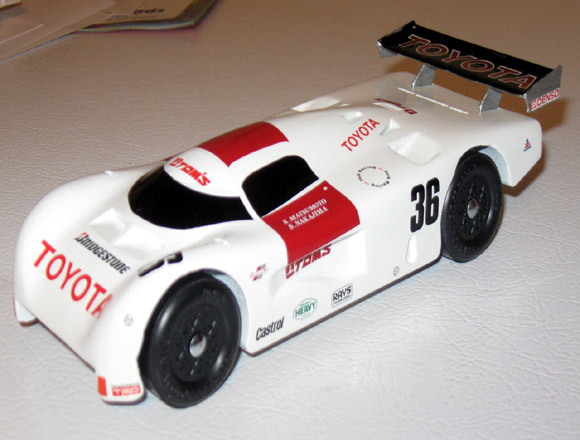 This car is a replica of the Toms 84c endurance racer. It has not raced, but was built for show and fun. I hope to work on getting it fast for future races. But really, when this car is sitting still it looks like it is going fast! I joined Cub Scouts with my stepson, Liam, last year. He was seven years old and I was the Den Leader. The den shrunk over the winter and there were only 3 boys who attended meetings. I was feeling mighty low. I was not a Cub Scout when I was young but wanted to be more involved with some fun stuff with my stepson. We received a pinewood derby kit from Santa at the Christmas pack meeting. 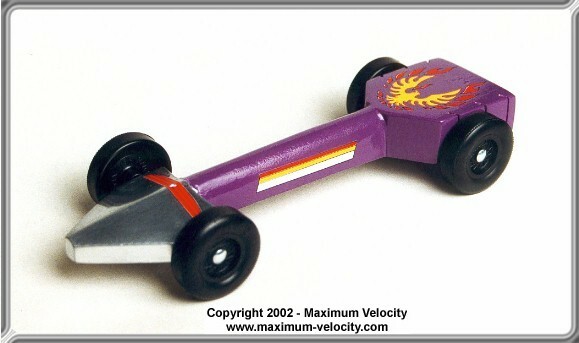 I did not do any research and knew nothing about pinewood derby racing. I admit that I did not even know the date of the race. There was a Pinewood work day scheduled, but it was canceled due to 30 degree rainy weather. I went to our den meeting and information was given about the race. It was the following Saturday! I told my son that given the short notice we would not be participating in the derby. Normally, he talks a lot and is very animated, but when I gave him the news he was very sullen. I found out later that he really wanted to enter the race but never had the opportunity. I was driven from that moment on. I took off three days from work and every day after school Liam sanded the car and I showed him how to use spray paint. When the eBay car showed up; it was really slick compared to the one we made. We went to the weigh-in and had both cars weighed. The eBay car weighed 4.94 ounces, the one we made was exactly 5 ounces. Liam had no idea that his Mom had bought an eBay car. Liam’s car ended up taking second place in the pack! The eBay car was not wasted. I entered the Leaders and Cheaters race and blew away every car we ran against. It was the fastest car in the pack and would have won the overall event. But, that doesn’t matter. What’s really important is that we did our best on Liam’s car. In our minds, it was the real winner. When using the Pro-Rail Rider tool, do you bend the axle for the raised wheel? If the raised wheel is accomplished by mounting the axle higher on the car body, then you don’t bend that axle. If you bend it up it may be too high to catch the rail on the braking section. This would allow the car to turn sideways on the braking section, resulting in a collision with other cars. Does graphite lose its ability to lubricate with age? As long as it is kept in a dry location, graphite should be good indefinitely.